The Tesla 2013 all electric roadster all electric sports car that does 0 to 60 in 3.7 seconds is really a spectacular looking car even if I could only look at it. I did manage to speak to the owner of the car. He is planning to drive it from Palm Springs California all the way up to Vancouver, Canada. This car is on par with all other sports cars in its range in terms of looks as well as in other areas such as speed and acceleration. It will go 245 miles per charge and takes 45 minutes to charge on a 240 volt circuit, longer on a 120 volt circuit. The owner was planning his trip much the same way many people would in terms of driving time and routes that he was going to take. However there was one more attribute that he had to take into account that most regular car drivers do not. Unless they are going through western Texas where there are not many places you can stop for gas. He was planning where he could stop for an electric recharge of his batteries. Between stopping at friends and taking advantage of a fledgling recharging network, he had his route to Vancouver all planned out. He planned to stop at the Tesla dealer to recharge. Dealers now have recharging stations for their customers. If more would adopt this approach, especially the North American car dealers, there would be a network of recharging stations across the country before you know it. Also if a customer or an owner of another competitors car stops at your dealership for a recharge. This provides a great opportunity to get to know the customer. They potentially can convert them into a buying customer sometime in the future when they need another car. This is a really fantastic car and owned by a Canadian. I was really surprised that the owner was a Canadian and was driving his car to Vancouver. This is an expensive car and not everyone can afford these types of cars. 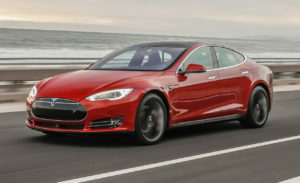 Tesla has had two relatively minor recalls for their Model S sports car. The last one was for a bracket that sometimes would allow the rear seat to become loose. It could become a projectile inside the car. No injuries or even any incidents have been reported, however Tesla is taking no chances. All owners of these cars can either wait for 2 hours while the repair is being made. Or they can take a loaner car while theirs is being repaired. This is really great customer service, regardless of how much they actually paid for the car. This particular Tesla all electric car was seen in Palm Springs at the 75th anniversary of the city. They had a number of exhibits commemorating the cities birthday along with a really fantastic fire works display. This was a wonderful evening capped by being able to see this car and speak to its owner about the car. He was obviously very proud of the car and looking forward to driving it home.